The Tough Mudder: Extreme client commitment! On Saturday 4th May, Anderson joined one of Selling Interaction’s clients, KAS BANK to complete the “Tough Mudder” challenge near Kettering, UK. The event involves 12 miles of assault course, with obstacles meant to instill fear into even the bravest: Electric shocks, underwater tunnels, 12 foot walls to scale, and endless, sticky mud. 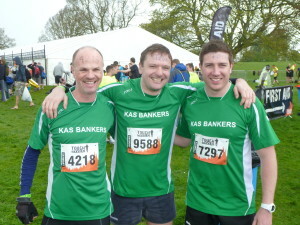 The team consisted of Andrew Watson and Steven Polese of KAS BAK and Anderson. It definitely helps in this event to have a team, as you have to help each other over the obstacles, not to mention cajole each other through some of the really nasty obstacles. We were in total agreement that the worst obstacle was the electric eel (http://toughmudder.co.uk/obstacles/electric-eel-shocks-on-rocks/) a lovely combination of water and electricity!! The event generates great camaraderie and I am sure the KAS BANK team enjoyed watching Anderson suffer after his challenges to them during sales training! All three successfully completed the event and were awarded with the much coveted orange Tough Mudder headbands!